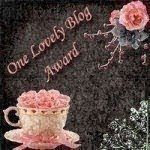 The lovely Tanya over at http://tanyatalksmakeup.blogspot.com nominated me for the one lovely blog award! So thank you so much hunny for my first award! I am over the moon & it means so much to me! Please go check out her blog! I love it! Each and every blog ive nominated i love & follow! Thanks again to Tanya for my very first award! I know what you mean, it was my first award too I was like :O haha. I was so tempted to give it straight back to you lol but i didnt know if you could do that or not? and thought you must already have one seens as you nominated me! lol! Thanks again darling, means a lot!